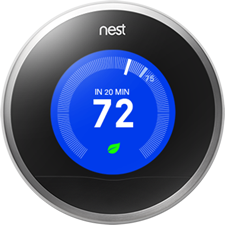 There are several things that you can easily do using a Nest thermostat to help maximize energy savings - and help minimize your utility bills. Using just a few of these tips can make a big difference. 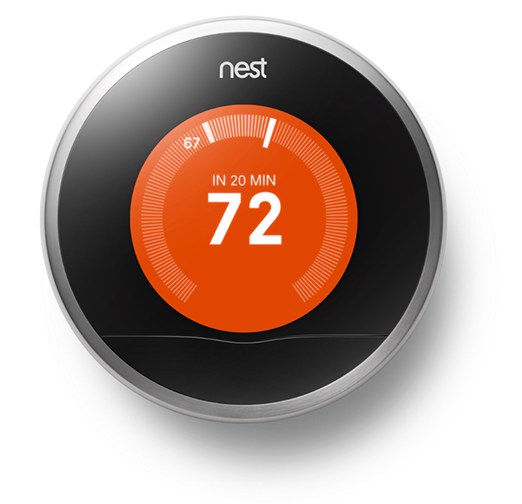 Your Nest Thermostat does almost all of the work for you. All you have to do is teach it what temperatures you like, especially during the first week you have it in your home. But even after it's created a schedule for you, it keeps learning from your adjustments over time. You're keeping warm under a thick blanket tonight, so turn the temperature down to save energy while you sleep. After a couple nights, Nest will learn this habit and start doing it for you. The Nest Leaf is an easy way to know you're saving energy, and it encourages you to continually improve your savings over time. 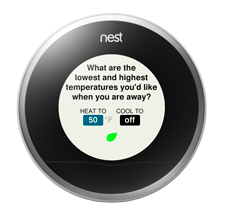 You'll see the Leaf on the Nest Thermostat display or in the app when you set it to a temperature that saves you energy. The more often you see a Leaf, the more you save. On average, for every degree you set back your thermostat, you can save 2% on your energy bill. Most people can't tell the difference between a room set one day at 70º and the next day at 69º. In fact, the difference in temperature between your nose and your toes is likely to be greater than 1º. Try a small 1º change in your temperature schedule, and see how much you've saved compared to the previous month in your Home Report. Nest's Auto-Away and manual Away modes will both turn off your system until your home reaches a minimum or maximum temperature that you choose during setup, on in your thermostat Settings > Away Temperatures. The more efficient your Away temperature is, the more you'll save. Just keep in mind the needs of pets and plants before you set it too low or high. You should set your Nest Thermostat to Away manually for maximum savings when you're on vacation, a long business trip, or anytime you're away for an extended period. While Auto-Away will automatically maintain an energy efficient temperature while you're gone, if it senses activity, like a friend coming over to water the plants, it could start warming or cooling the house. Setting your thermostat to Away manually keeps your home at the same energy efficient temperature until you wake it up with the Nest app or by pressing the thermostat ring. A thermostat is an on-off switch, not an accelerator. So for most heating systems, turning the temperature all the way up won't heat your home faster. It just runs your system longer. If you want it to be 72º inside and you turn the heat up to 90º, it will warm just as fast as if you turned the heat up to 72º. When you change the temperature, make sure to look at Time-to-Temperature on the thermostat screen to get a sense of how high or low to set the temperature. You may not know if you want it to be 72° or 74°, but it's easy to see the difference between running the heat for 15 minutes versus an hour. You'll also see the results on your energy bill. Just like a fitness tracker, Energy History shows you your energy use over time. You can view the last 10 days of your heating and cooling activity, and how your temperature choices, Auto-Away and the weather influenced your energy usage for instance. It's a great tool to build better habits to save even more in the future. Using the fan of your heating and cooling system to make a house more comfortable sounds like a good idea. It uses less energy than your AC for instance and will do a good job at keeping the air a consistent temperature throughout your home to reduce hot and cold spots. However, keep in mind that the typical fan requires more energy than many homes use for lighting. If you keep the fan on all day, it will use as much energy as a typical air conditioner running for three hours straight. Over time, this can add up to a lot of unnecessary energy use. Try using the fan control with your thermostat or the Nest app to schedule your fan to turn on for 15, 30, 45 or 60 mins each hour for a certain time period during the day. In many parts of the world, there are long periods of the year when you can harness Mother Nature's heating and air-conditioning power with your home's windows, blinds and curtains to help maintain the temperature you want. For example, if you live in a place with cool summer mornings and hot afternoons, you'll save a lot of energy by opening up the windows while it's cooler and closing the windows and blinds when the day starts to warm. Try opening the windows at night, and don't use the AC in the morning. The next day, don't open the windows, and just use your thermostat to adjust the temperature. Look in Energy History on the third day to see the difference in how much energy you saved. If you have more than one thermostat in your home, teach them differently so that they build schedules for each part of your home that they control. You can save even more energy by closing the interior doors between the different areas of your home. This will help to keep the warm or cool air where you want it and prevent your system from switching on when it doesn't need to. Any time you're overheating (or overcooling) one room just to be comfortable in another, you're using extra energy. If you find that some rooms in your home are too cold or too hot, try making gradual adjustments to the vents or to the radiators in each room - close the vents for a room that heats up too quickly (or cools down too quickly when running the air conditioning).